I (Helen) made about 32 small black and white square tiles (thickest setting on the pasta machine). I used my extruder to make the pattern. 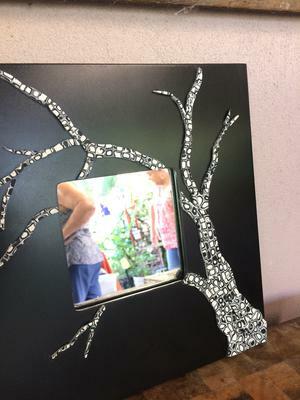 These were then used by a member of my mosaic club (Denise) to create a stylised tree on a mirror frame. After a bit of experimentation trying to cut the tiles with scissors, Denise turned to using a Stanley knife which she says easily cut the tiles to the shapes she required. I think this is a fabulous combination of techniques that has fired all our imaginations. I hope you like this experiment.